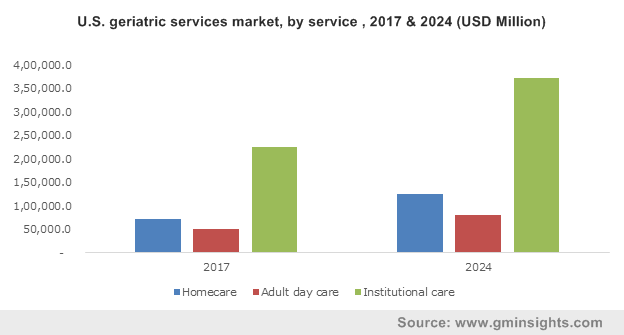 Geriatric Care Services Market size was valued over USD 842.0 billion in 2017 and is expected to witness more than 8.5% CAGR from 2018 to 2024. Continuous rise in geriatric population is increasing the financial demands on our health care system. According to the Global Health and Aging report by the World Health Organization, people aged 65 and above is projected to grow from an estimated 524 million in 2010 to nearly 1.5 billion in 2050, specifically in developing nations. Such increase in the elderly population will eventually result in greater application of geriatric care services, hence boosting the market growth. Moreover, comorbidities such as diabetes, renal insufficiency and arthritis, and metabolic changes are quite common amongst the elderly population that makes them more susceptible to infection. In addition, the combination of increased comorbid conditions and the decrease in activity of the immune system of elderly population is further driving the market for geriatric care services. Also, recent technological evolution in geriatric care services will benefit the growth of geriatric care services market in the upcoming years. High cost of geriatric care services will be a major market impeding factor. Also, the lack of proper geriatric care services in developing countries will hinder the growth of business in the long run. Institutional care market held the majority of the market share and was valued USD 545,328.5 million in the year 2017. It majorly involves all nursing, hospital diagnostics and laboratory expenses and other emergency room expenses, thereby accounting for maximum market share. In addition, institutions such as nursing homes and assisted living facilities provide much more adaptable care to older patients where they can be free from rigid timetables, hence accentuating the market segment growth. Home care market is estimated to grow at a robust CAGR of 9.2% during the forecast timeframe. Recent surveys have shown that about 90% of older population prefer to stay in their home for as long as possible. Home care enable patients to remain as independent as you can be. Additionally, according to a study in the Journal of the American Geriatrics Society, home care is associated with longer life and a lower risk of rehospitalization, that will result in enhancing the business growth in the near future. Public service provider market captured the largest market share in 2017 and was valued around USD 616,025.4 million. Such type of healthcare service provider offers quality medical services it to everyone regardless of their ability to pay. The government controls the price of medication, treatment and medical services through negotiation and regulation and hence, eliminates the administrative costs of dealing with different private health insurers, thereby driving the market growth segment. Private service provider market is estimated to grow at a considerable CAGR of 9.1% over the projection period. Private service providers help patients to avoid public hospital waiting lists and patient priority order and grants the ability to choose one’s own doctor or surgeon, hence affecting the market growth positively. Public insurance market had maximum market share and was valued over USD 610,650.8 million in the year 2017. Such type of payment source is preferred by major chunk of global population as it is much more affordable health insurance for uninsured citizens who are either unable to afford the rates of or are rejected by private health insurers. Hence, the public insurance market for geriatric care services is dominating the global market. Private insurance market is estimated to grow a at CAGR of 9.2% over the forecast period. Various private insurance companies help to avoid the Medicare levy surcharge, save money long-term, and makes sure that public hospital waiting list is not very long, hence propelling the market growth in the long run. The market for 86-90 years geriatric population had maximum market share and was valued over USD 307,462.7 million in the year 2017. This age category is susceptible to an array of diseases such as chronic infections, orthopaedic diseases, diabetes, heart diseases, stroke, cancer, and many others, that would drive the demand for geriatric care services. The market for 65-70 years geriatric population is estimated to grow a at CAGR of 9.9% over the forecast period. Factors such as unhealthy lifestyle, increased proneness to chronic diseases, including cancer, chronic liver disease/cirrhosis, chronic obstructive pulmonary disease, diabetes, hypertension will boost the market segment during the forecast period. U.S. dominated the North America geriatric care services market and was valued at around USD 345,927.3 million in the year 2017 owing to huge prevalence of geriatric population. According to the Population Reference Bureau, the number of Americans aged 65 and older is projected to become double from 46 million in 2016 to over 98 million by 2060, and the share of geriatric population out of the total population will rise to nearly 24% in 2060 from 16% in 2016. 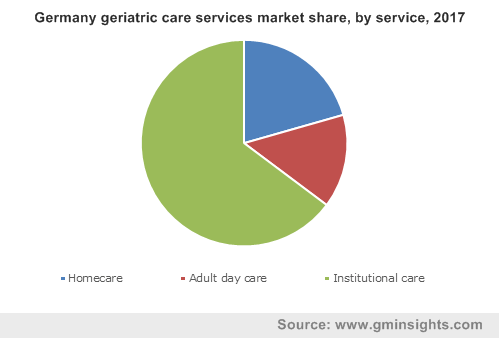 India geriatric care services market is estimated to grow substantially at a CAGR of 11.0% during the projection period. Growing aging population, changing family structure, favorable infrastructure for emerging geriatric care services and increased awareness levels among the ageing population towards healthy lifestyle is likely to boost the demand for geriatric care services market in India. 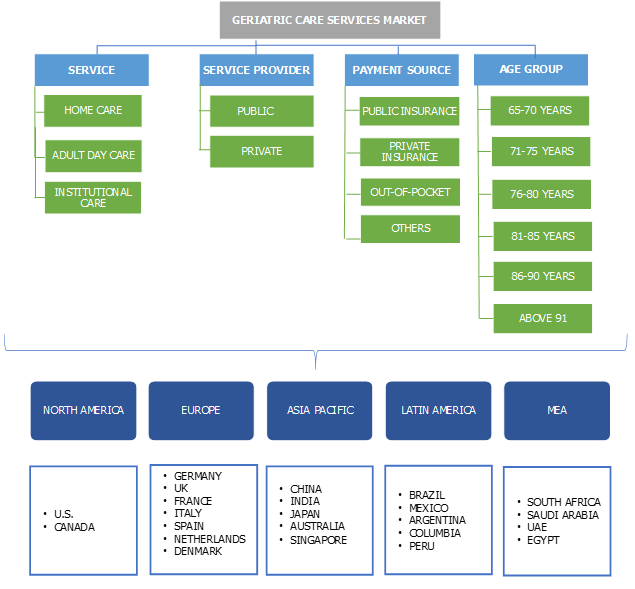 Global geriatric care services market share is competitive in nature and dominated by limited number of players. Brookdale Senior Living Inc., Extendicare Inc., Gentiva Health services, Inc., Kindred Healthcare Inc., Senior Care Centers of America, Sunrise Senior Living Inc., Genesis Healthcare Corp., Home Instead Senior Care Inc., and GGNSC Holdings, LLC are the predominant industry players. These companies implement important strategic decisions such as mergers, acquisitions, partnerships and collaborations to expand their product portfolio and geographic reach. Few examples of mergers include Genesis Healthcare and Skilled Healthcare Group, Brookdale Senior Living Inc. and Emeritus corporation, and Kindred Healthcare Inc. and Gentiva Health Services. 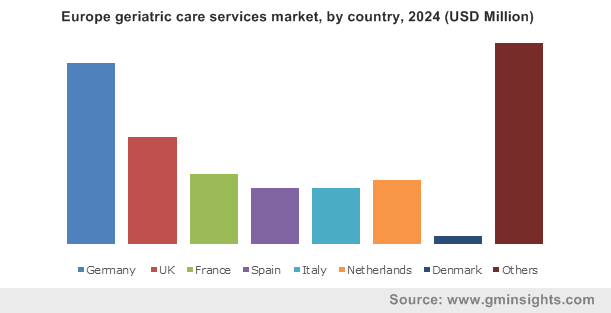 The global geriatric care services market is driven by regulations such as Medicare and Medicaid reimbursement, increasing technologically improved senior care services, and booming healthcare industry. The government is constantly aiming to improve adult quality of life, decline the necessity for care, ensure positive care practices and safeguard the geriatric population from causing harm. Hence, such strong geriatric care services allow seniors to remain independent in a professionally managed and carefully designed community setting, hence boosting the market growth.